My little kids are obsessed with pirates. Our swing set out back is officially a pirate ship (fueled by swing power, of course), and I’m regularly asked to play Captain Hook. 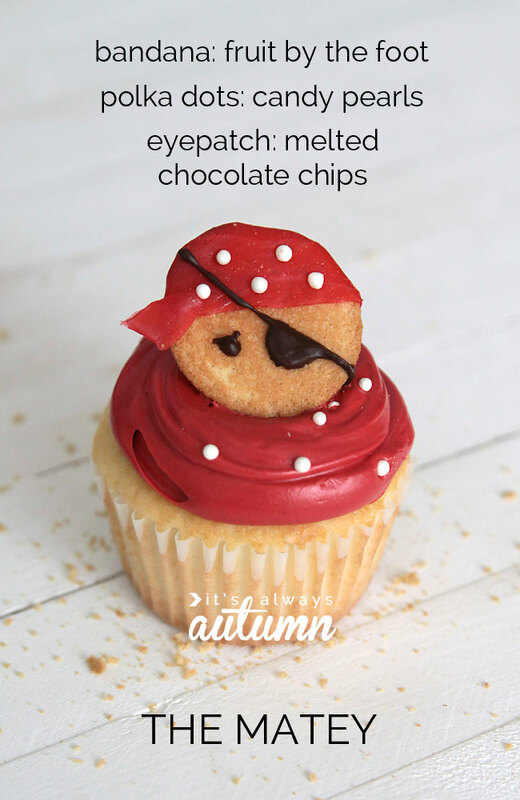 Last week I decided to win some “great mom” points by making some pirate cupcakes, so I started searching Pinterest for ideas. Much to my dismay, all the cute pirate cupcakes were made using fondant, which I just think is plain icky. I know, I know, there are certainly “better” fondant recipes out there, but I have yet to try one that tastes anywhere near as good as plain homemade frosting. Plus, crafting fondant creations is just beyond me – I’m pretty terrible at decorating cakes – so I needed to come up with something easy. 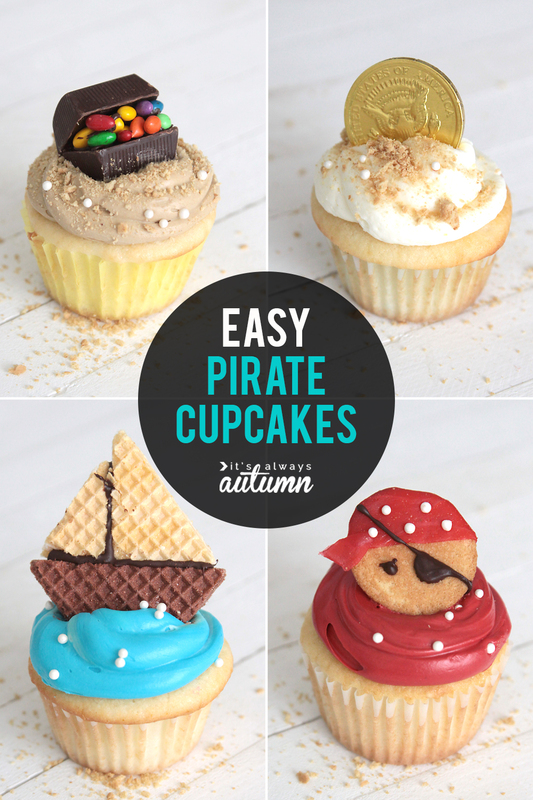 So the troops and I set out to the store to figure out how to make cute & easy pirate cupcakes using candy, not fondant, as the decorations. 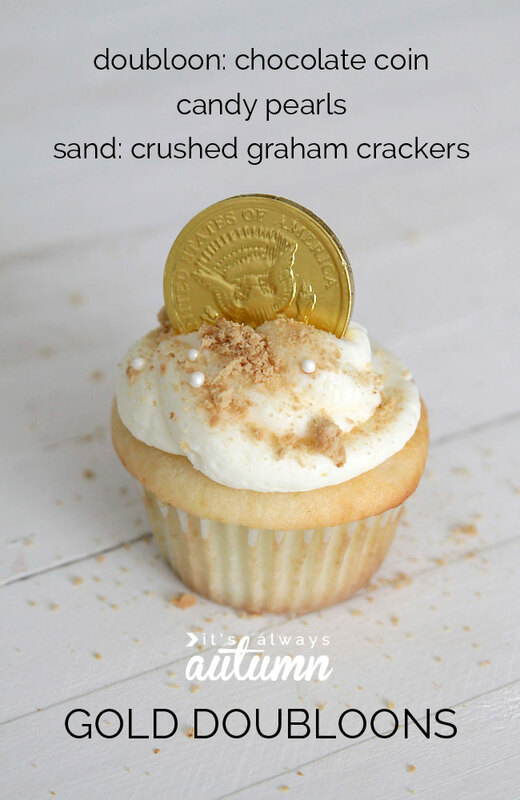 We started with an easy one: gold doubloon cupcakes. I scooped frosting into a sandwich bag, cut a hole from a corner, and “piped” the frosting on, starting at the outside and swirling into the middle. 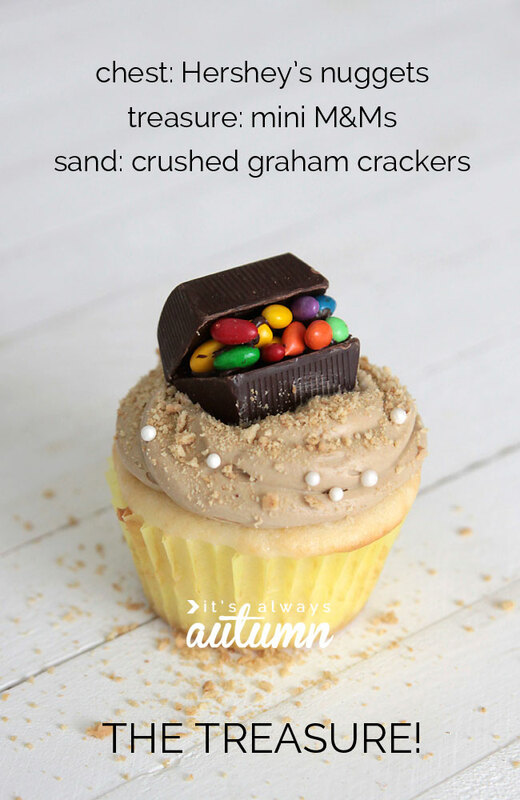 We crushed up graham crackers to make “sand” and then dropped on a few candy pearls (I found these by the cake decorating stuff in the baking aisle – they’re called cupcake gems by Betty Crocker). Top it all with a chocolate coin and you’re done! Easy. For these I used a sharp knife to slice vanilla and chocolate sugar wafer cookies into the right shape. 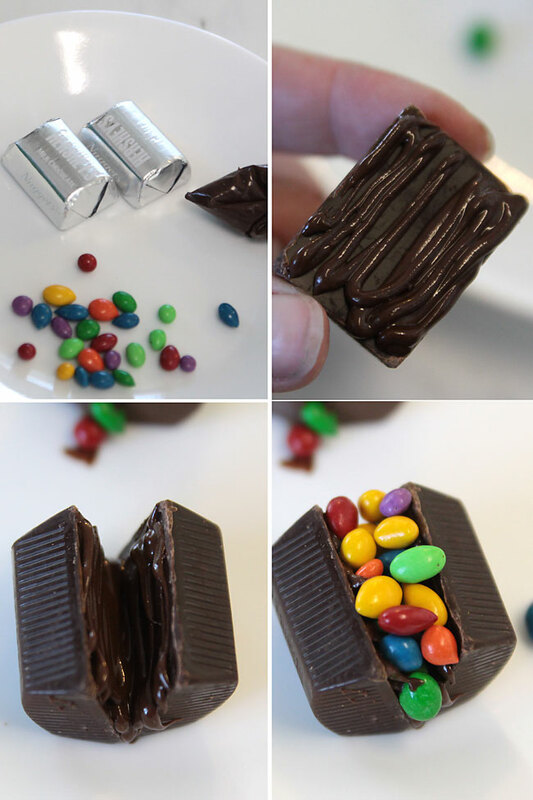 Then I put some chocolate chips in a sandwich bag, melted them in the microwave, clipped off a corner of the bag, and piped chocolate out to “glue” the ship together. I laid the ships down flat on a plate and popped them in the freezer for a few minutes to harden up. 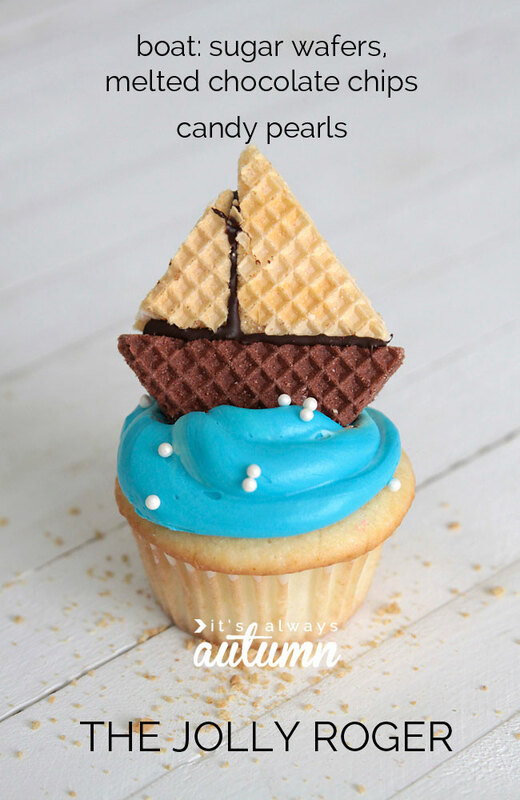 TIP: if your frosting isn’t stiff, it helps to stick a toothpick behind the ship once it’s on the cupcake so it doesn’t fall over. Next we made treasure chest cupcakes. His face is a vanilla wafer cookie. I wrapped a piece of fruit by the foot around the top third or so and folded it over onto the back (just squish it down on the back and it will stay). I added more candy pearls to make polka dots on the bandana and then used more melted chocolate chips piped from a bag to make the eye and eye patch. To get the dark red frosting I used baking cocoa and lots of red food coloring in white frosting. Very cool! I love that treasure chest one! Thanks! The kids were pretty excited about the treasure chest, too. These are fabulous! I agree about the fondant. So genius of you to come up with all these fabulous designs using tasty ingredients 🙂 My favorite is the treasure chest! Thanks! I was pretty excited when I realized the Hershey’s nuggets would work so well. these are SO cute. I absolutely agree with the fondant issue. It’s disgusting! I love how you just used common candies instead. Thanks! My kids and I had fun at WINCO looking at all the candy in the bulk section and trying to figure out what we could make! Wow! Those are fantastic! (I pinned it!) Did they take a long time to make? They are amazing. I am totally making them for the YW camp fundraiser auction! This kid-starved non-mom, non-auntie just “embraced” the four boys – all under 3rd grade – to be pseudo-nephews. Keeping crafts super simple. 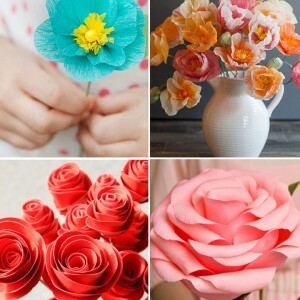 Can’t wait to do these – thinking June. 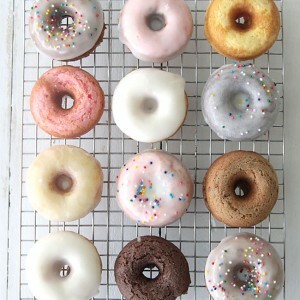 Will take the cupcake blanks, let the older boys (two seems a bit too young) dye the frostings. 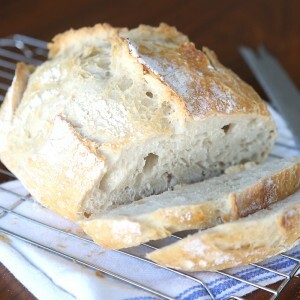 These are so stunning yet simple, I predict it knocks their parents’ socks off! THANKS! Thanks so much for these – I just finished making a batch of the treasure chests for my son’s 8th birthday party tonight. (I wanted to do the pirate heads too, but the store I was at only had tie dyed fruit by the foot, so I stuck with the treasure chests). Your instructions were easy to understand and super helpful. Love it! My 4 year old daughter and I had a blast when we made the treasure chest cupcakes for her class pirate party. I love these that we can work on together. After posting the pictures on my FB page, I received loads of comments so I shared your website. Thanks for the great idea!! 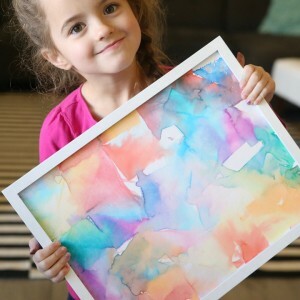 I am planning on making these for my son’s 6th birthday, I am very excited! Can you elaborate on the red frosting? I’ve never had red icing turn out actually red, it always turns pink. How much cocoa to red dye did you use, approximately? These are great! The company I work for are promoting a charity event based about pirates and we were looking for ideas! Can I use this as part of my campaign?